A subtalar dislocation, a/k/a peritalar dislocation, refers to the dislocation of the talocalcaneal and talonavicular joints. These joints represent the distal articulation of the talus bone. A subtalar dislocation can occur in any direction. However, it is reported that approximately 85% are medial dislocations and 15% are lateral dislocations. A medial dislocation, named for the direction of the distal boney structures, refers to a medially displaced calcaneus relative to the talus. 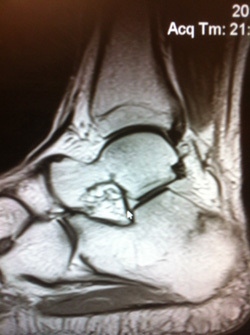 This type of dislocation is usually associated with an inversion injury to the foot and low-energy forces. A lateral dislocation refers to a laterally displaced calcaneus relative to the talus. 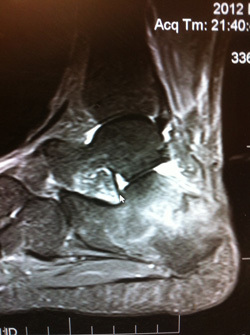 This type of dislocation is usually associated with an eversion injury to the foot and high-energy forces. Upon presentation, the patient's foot is grossly deformed in appearance. Up to 40% of lateral dislocations may present as an open injury, usually secondary to the talar head damaging the surrounding soft tissues. In closed dislocations, the skin can appear tight or stretched over the boney deformity making the skin susceptible to tissue breakdown. For this reason, prompt reduction of the injury is important. In addition to the skin exam, a thorough neurovascular evaluation should be performed. Due to the gross deformity of the foot, it may be difficult to obtain accurate AP and lateral radiographs. However, x-rays need to be taken for complete evaluation of the foot and ankle. Commonly, fractures are missed upon initial review of the x-rays. CT evaluation may be warranted if a fracture is suspected.